The Honda Mobilio is a large seven MPV based on the Brio and the Amaze from the house of Honda. They have already introduced this model in the Indonesian market and have received a good response there. Known for its tremendous amount of space, Honda will be taking the wraps off its much anticipated Mobilio MPV in India in July. Honda is fully geared on production to meet the target date for the India launch. Honda’s popular Brio hatchback, Mobilio was first seen at the Delhi Auto Expo 2014. The Mobilio despite being a big bulbous MPV is pretty attractive. Honda has used bold lines and smart details to amp it up, which has really seemed to have work. If you look closely at the car, head on, it does look a lot like the Brio. Though the MPV has similar headlights and grille, Honda has made a lot of other styling additions. The front has a few nice matt black sections and the chin of the car is new. But from the A-pillar onwards the car has its own identity. The sideline of the car looks different with a kink or lightening strip in the door line. The rear pillar is floating with glass all the way to the back. The biggest difference from the Brio is the massive 2650 mm wheelbase that gives the car the choice to give a massive rear door and the acres of space at the back. What you also get, is of course, two extra seats at the back, the third row. There is plenty of legroom and thigh support. The second-row seats can be adjusted and are placed on a ramp. The dashboard is the same as in the Brio and the Amaze. The Mobilio, when launched in India, may get a two-toned dashboard with more chrome, and a 2-DIN touchscreen audio. Under the skin, the petrol Mobilio will have a 1.5-litre i-VTEC petrol motor, which can generate a power of 117 bhp. The diesel variant will come with a 1.5-litre i-DTEC diesel unit with 98 bhp, which also powers the City and Amaze. The engine will come mated to a five-speed manual and CVT gearbox. While the diesel model of MPV Mobilio is expected to deliver 26 kmpl, the petrol version is likely to give 18 km pl. 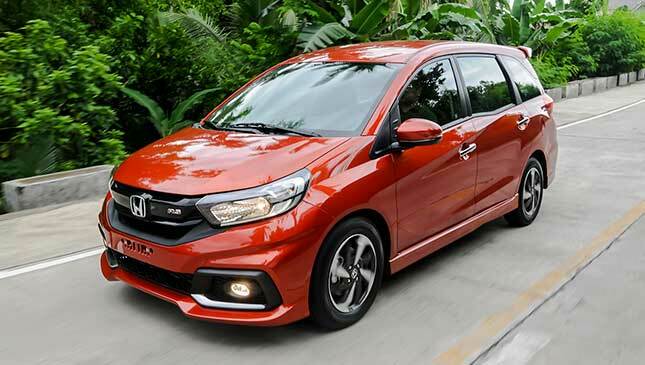 The Mobilio is Honda’s first MPV and is the country’s most fuel-efficient vehicle in this segment. The company has commenced the booking for Mobilio and the vehicle, which is expected to fall in the Rs. 6.50 to Rs. 10 lakh price range will challenge the current front-runners like Maruti Suzuki Ertiga, Chevrolet Enjoy and Nissan Evalia.